The teeming industrial township of Meerut in Uttar Pradesh lays claim to being the largest maker of hand-forged scissors in the world. 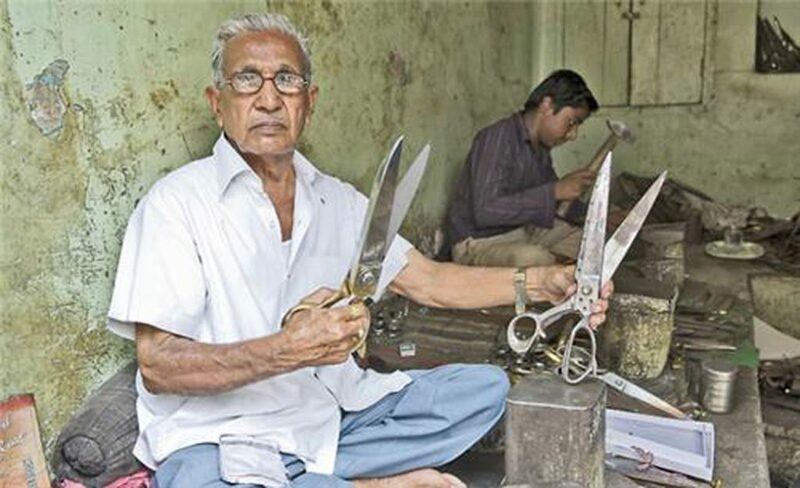 In small workshops across the city and in its neighboring villages the process of forging over 16 different varieties of these sharp-edged scissors is part of a four century old tradition. 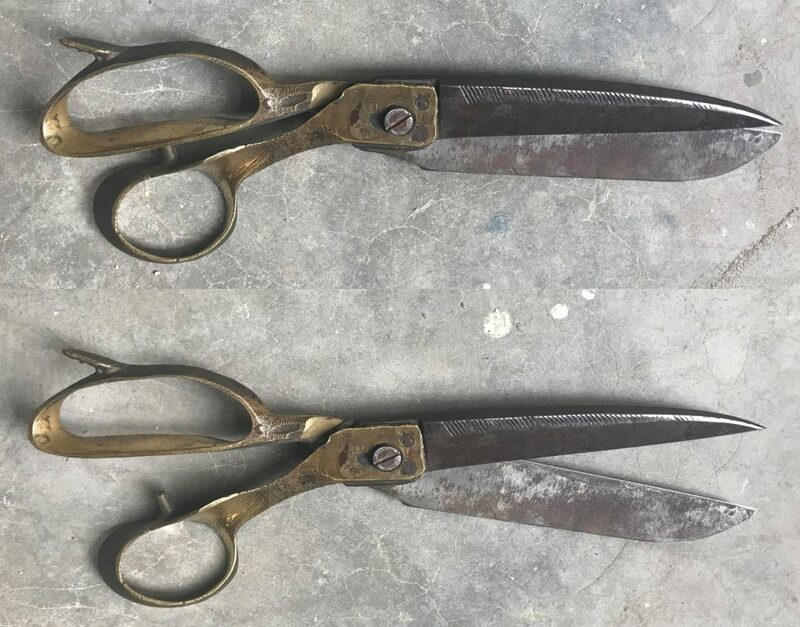 Shipped across the country and overseas these scissors are reputed to last beyond a century of use. 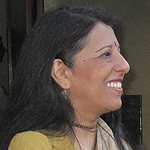 The rootof the Meerut scissor lies in the culture of betel-leafoffering and eating. The making-up of the paan was and remains an elaborate procedure and its ingredientsinclude fragrant spices, rose preserve, tobacco, coconut shavings to finely cut Areca Catechu/betel-nut. The tools were equally important and the finely crafted betel-nut cracker was an essential component. From the elaborately ornamented to the most basic the crafting of these nut-crackers required sharp blades and a pivot. It was from this start that the ingenuity of the craftsperson extending itself to producing the cut-throat razor and scissors. 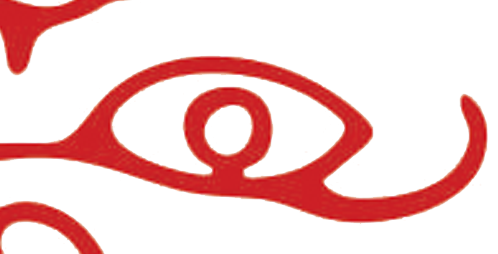 An apocryphal legend talks of the inventiveness of anAsliAkhon who first produced the scissors. His technique was rapidly copied and the industry grew as did its reputation for strength, versatility and the sharpness of its products. 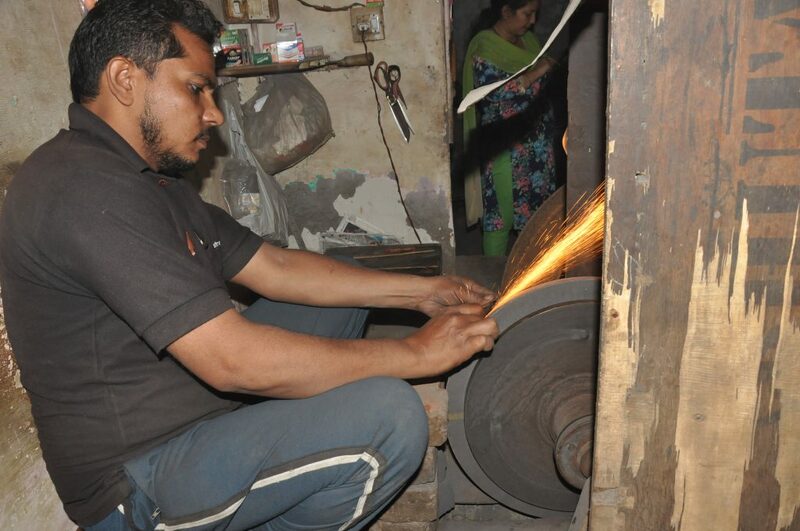 The nut-crackers, razors, knives and scissors of Meerut followed the same processing principles and the products continued to flourishtill the World War II. Soon after competition from other makers both in India and overseas triggered a decline till the Government set up a heat treatment workshop in 1951 to improve quality. The Meerut scissor hasn’t looked back since with demand constantlyoutpacing supply. With over 250 small-scale units, employing over 70 thousand people both directly and indirectly it is the men who forgethe scissors while women pack and check quality. 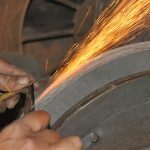 The crafting process uses minimal machines with the cut blades being arched and twisted slightly by the craftsman along the cutting-edge to achieve a tension and frictionbetween the two edges to create the cutting force.The precision grinding of the cutting edge and its anglingdepends on its final use. Shaped and balanced the craftsman then rivets the two bladestogether with an adjustable metalscrew. This allows for replacement of broken blades, for rebalancing and for repair. The blades are made of carbon steel that is sourced from scrap salvaged from railway rolling-stock and the automobile industry that is upcycled as a toughened scissors.The off-the-shelf sizes vary from 6 to 16 inches and are angled according to its requiredpracticewith the handles cast in brass and fused on to the blades. Ergonomically designed the grip of the handle is fitted to exert power and precision. Scissors are always taken for granted till they start to malfunction and the bane of scissor user is an uneven cut, superfluous effort ora damaged blade. 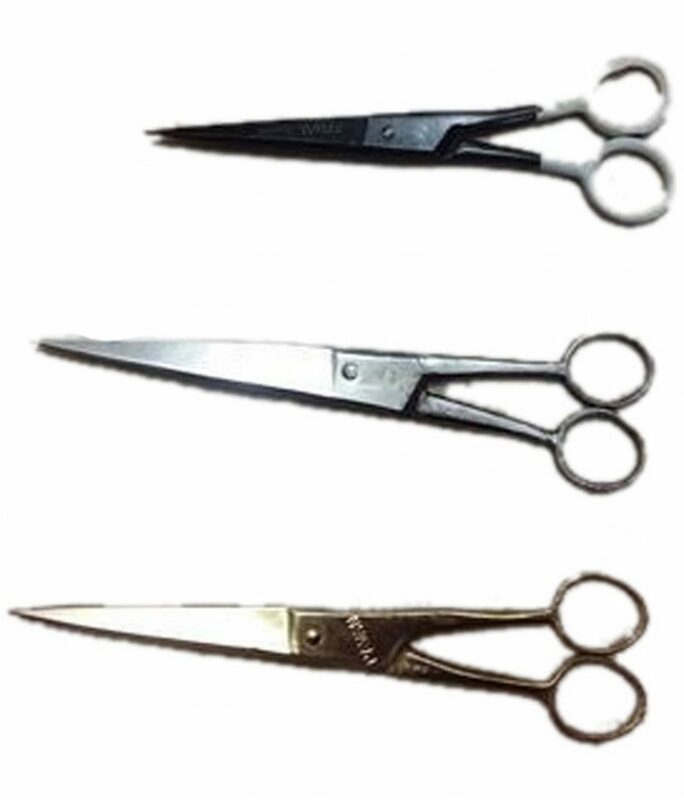 That is what makes the Meerut scissor so extra special and a must have in tailoring units, leather factories, barber shops, offices and homesas unlike most other scissors available in the market place the Meerut scissor is not a throw away item as it repairable and re-adjustable, while its blades can be re-sharpened as many times as required. 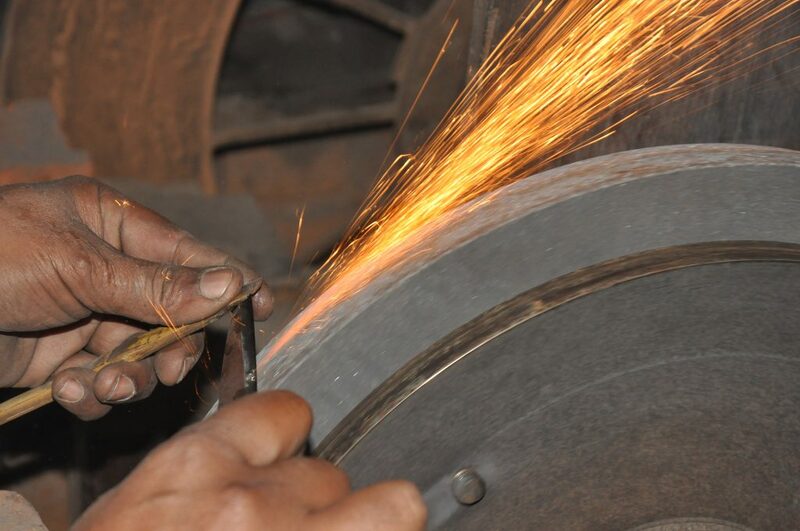 Several other factors combine to make the Meerut scissor a great Indian success as a corollary to its crafting is the huge network of tertiary jobs and skills it has spawned. 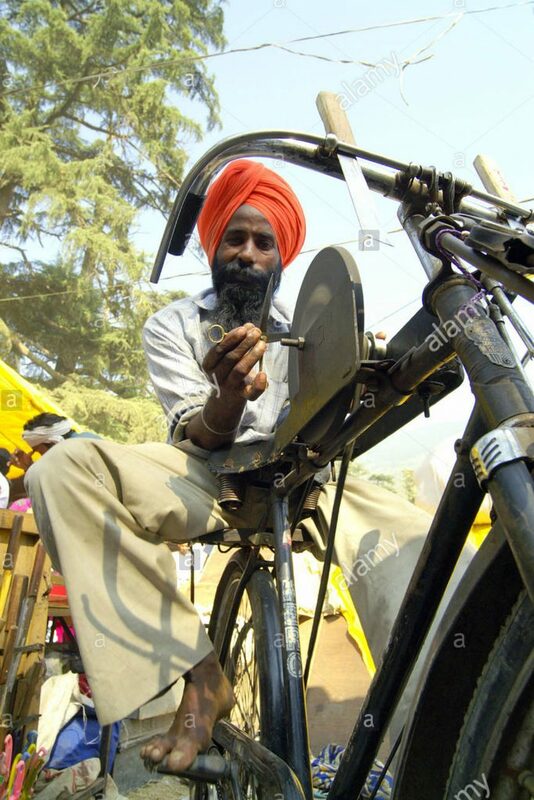 Across India from large urban cities like Delhi, Kolkata, Mumbai, Bangalore to Chennai and on to the smallest village, scissor-sharpeners in small workshops or moving around from door-to-door on cycles or on foot call out their services of sharpening and repair. This makes true the maxim of the Meerut scissor Dada le, potaabarpe /bought by the grandfather, and still in use by the grandson. Scissor sharpner on a bicycle.